Last week I wrote about the new revisions to Foursquare in Foursquare 3.0, and there are some pretty great features for users of the app, such as myself. However, Foursquare also announced some enticing new features available to merchants that'll help you attract new customers to your location and also support repeat business all for free! If you're still not listed on Foursquare now's the time to get started, so what's first? Claiming your business of course! PRO TIP: Already convinced? If you're eager to get started, scroll to the bottom of this post for some awesome how-to videos to help you get started right now! In order to get started with claiming your Foursquare venue you must first have a Foursquare account, so head on over to their website and sign up. Once you're done with that, search for your business on Foursquare and click the Claim button at the right of the page. It should look a little something like the image above. If you don't find your business when you search for it you can add it to Foursquare's directory and get started that way by visiting foursquare.com/add_venue and filling out the form. Not too difficult so far, right? That's all well and good, but the coolest part about Foursquare (and the most beneficial to business owners) is setting up specials to help attract new customers and reward customer loyalty. The best way to do that is by creating specials. What is a special you ask? Basically, a special is an incentive for someone to check in at your location. For example, you could give a special that was 10% off a purchase for checking in. A customer checks into your location, the special becomes available to them, and they get a great deal while you make a sale! Fortunately with Foursquare 3.0 there are now 7 different types of specials, some of which focus on customer acquisition while others focus on customer retention. If you want to see a detailed list of the specials check out my original Foursquare 3.0 blog post. You can setup your special now by visiting your venue's page. Once your first special has been approved it'll be listed both on the website and in Foursquare's various mobile applications, which now include the ability to favor venue results that have specials over those that don't. What that means is that by setting up specials you'll have a higher search rank in Foursquare's listing results, and as a result more folks have a chance to see your business. Probably the most underrated and underused aspects of Foursquare is there analytics section. That's right, Foursquare allows you to track how users interact with your listing on Foursquare. By clicking the "Venue Stats" button you can see check-in data, including days and times that your venue sees the most activity and which of your visitors are the most-loyal. You can also use this information to track the effectiveness of the specials you're using. Did visits spike after you activated your most recent special, or did they have no effect? As with all social channels you use to interact with potential customers, adjust accordingly to their reactions! If a certain special produced results, try variations of it. Ultimately Foursquare is all about providing value to your customers and turning them into repeat customers as a result, so try to tailor your specials to their requests. This handy how-to video will get you started on the right foot. It's a great visual guide in case you get lost, so be sure to keep the video open while you're walking through the steps! 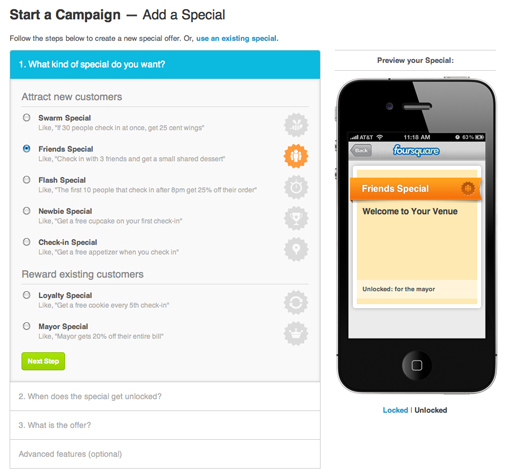 Step 2: Search for your business using the Foursquare search feature, and click the Claim button to the right of the page. Step 3: If you don't find your business when you search, you can add it by visiting If you don't find your business when you search for it you can add it to Foursquare's directory and get started that way by visiting foursquare.com/add_venue and then claim it by using Step 2 above.